Each year in the United States an estimated 2,500 children age 14 or younger are injured and 560 killed in residential fires. Of these children, over 50 percent are under the age five, 70 percent are under the age of 10. Because the majority of fire casualties occur in children under the age of 10, FireSafety.gov for Kids is targeted towards that age group. Increase the level of individual concern and awareness of children's vulnerability to fire. Educate and inform the U.S. population about how personal responsibility and action is key to preventing fires and fire-related casualties. Provide a timely, coordinated and easy-to-access source of information about how individuals can prevent fires and fire-related casualties. On this Web site, you will find short lessons about fire escape planning, smoke alarms and general home fire safety. It is recommended that an adult guide children through the lessons. Each lesson is followed by a brief five-question quiz to test children's knowledge of the subject after they have worked through the lesson. Also on the site, you will find games to reinforce the information learned in the lessons. Finally, through a 10-question quiz, children will have the opportunity to earn a Jr. Fire Marshal certificate signed by the U.S. Fire Administrator. 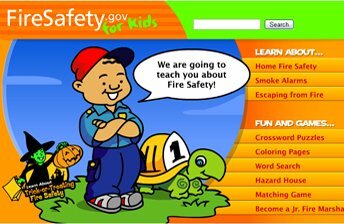 Please e-mail us for further information about FireSafety.gov for Kids. 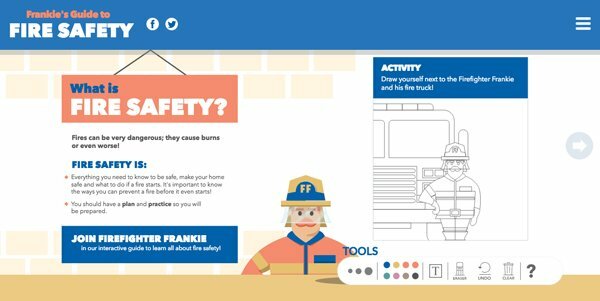 Join firefighter Frankie in an interactive guide to learn all about fire safety.